8 DECEMBER 2018 – final seats for 2018! 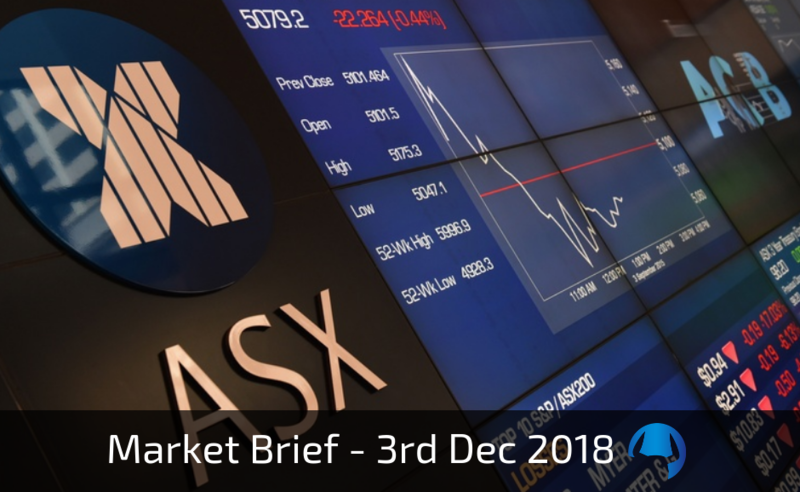 The ASX is once again testing a key area and we will be discussing this week whether this market can bounce higher or will need to break lower first in the LIVE CHAT ROOM. The DAX is holding on and managing to post an unconvincing close higher last week. Can it follow through this week? Last week we stated all eyes were on the S&P and the situation has not changed this week heading into the last NFP for the year. We will be discussing this market in more detail in the LIVE CHAT ROOM. For a move higher we would like to see the S&P hold above 2760. Should this occur we could see another retest of 2785, and if momentum remains strong to the upside we cannot rule out a moves to 2808 and 2838. If we cannot hold above 2760, we could see this market continue to sell-off into 2736 before another pause. A break of this level however may result in quick move down to 2704; and if momentum to the downside remains strong we may see a move down into 2680 and 2660. The Aussie dollar is flirting with a key double top as buyers continue to raise prices. This is a big week set for the Aussie Dollar and we will be discussing this in more detail in the the MEMBER PORTAL. For a move higher we would like to see the AUD hold above 0.7282, followed by a retest and close above 0.7364. A strong break and close above this level could see a quick move to 0.7447 before a pause; and if momentum remains very strong we will look for a big move into 0.7489. If we cannot close above 0.7282, we will look for a move back down to 0.7229. A strong break below this level may result in a move down into 0.7169 before another potential pause. Any subsequent breaks of this level however may result in a very fast move down to 0.7112. This Euro has remain unchanged last week and thus our levels and commentary remain the same. The Pound is now in danger of much lower prices if buyers cannot hold this market here. We will be discussing this in detail in the MEMBER PORTAL this week. For a continued move to the upside, we would like to see Cable close above 1.2868, followed by a retest of 1.3035 and 1.3161 before a pause. Should this occur we will look for a move to 1.3191 and 1.3277; and if momentum is very strong we could see a re-test of last week’s highs into 1.3386. The $/YEN continues to grind higher and this market should now be watched closely for any signs of weakness; as we gear up for a BIG move.